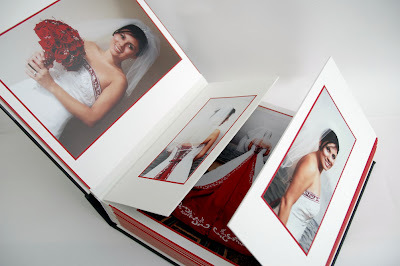 Okay, if you're a client of ours you know that we are SUPER picky about our albums. And you don't even see the "behind the scenes" work that goes into our album designs... we spend many hours making the preliminary design and final draft of an album, and retouching each image that will be in the final version. 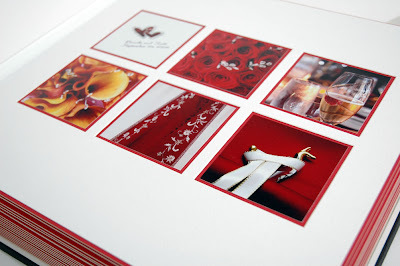 We have favorite techniques for incorporating favorite images in the album, pacing the story and graphic elements in order to ensure that looking at the album is an emotional and narrative experience. So we were flattered and honored that our album company decided to feature one of our recent books on their website. Scott and Priscila's red-themed wedding called for drama, elegance, and quality, and we knew that a Queensberry Album would be a perfect fit. Here's a snapshot of a few of the page spreads... read the whole story here.